The La Crosse Tribune profiled two members of the Blue Stars color guard in a recent article. Twenty-year-old Travis Gerke is a first-year member and 18-year-old Julia McCune is a fourth-year member of the corps' color guard. Read the article on www.lacrossetribune.com. 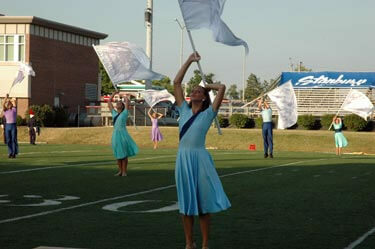 Blue Stars' color guard performs in Normal, Ill., on June 30, at the DCI Central Illinois major event.